After 10+ years’ hiatus, I’ve taken up another old interest of mine: handspinning. A week or two ago, I wandered down to my local yarn shop, Purlescence Yarns, because I had heard they were stocking weaving supplies. In particular, I had heard that they had a computer-driven Louet Megado, which startled me because that is a mighty high-end, complex loom for a yarn shop to be selling. Having a Megado on their floor meant that they were serious about selling to weavers, so I drifted in to suss out their offerings. In addition to weaving supplies and equipment, and the expected array of knitting yarns, Purlescence also sells equipment and materials for handspinning. There’s a largish flock of spinning wheels on their shop floor, plus four or five drum carders, and a wall dedicated to spinning supplies – natural, commercially dyed, and hand painted rovings, plus a little bit of fleece. And other spinning goodies, like spindles, hand cards, blending boards, etc. If you’re in the Bay Area, you should definitely check them out. They’re in Sunnyvale, so South Bay folks (like me!) 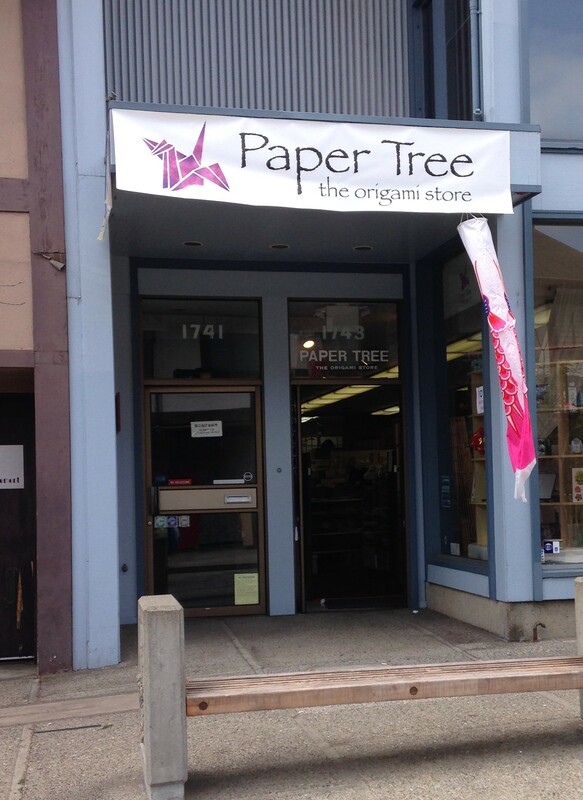 should be especially excited – we haven’t had a good fiber arts shop down here for ages. Anyway, I had decided beforehand that I was not buying any more weaving yarn – my stash is embarrassingly large already! But ooh, pretty colors! I wound up walking out with a four-ounce braid of rainbow-colored hand-painted roving, 50-50 silk/merino, from Greenwood Fiberworks. It’s gorgeous. I was berating myself for the complete uselessness of this purchase (I haven’t spun anything in ten years, don’t own a spinning wheel, and had no intentions of picking up spinning again) when it occurred to me that hey, maybe I could use a drop spindle and spin while walking! I had been trying to get myself to exercise more, but was stymied by my subconscious, which has zero patience for anything it considers unproductive. “Are we done yet? Can we go do something useful now?” Having to listen to your subconscious whining in the back seat for the entirety of a one-hour walk is a real demotivator, so I was having trouble getting myself to go for even short walks. spindle + roving = exercise motivator! Having started spinning again, of course, it was inevitable that I would acquire a stash. 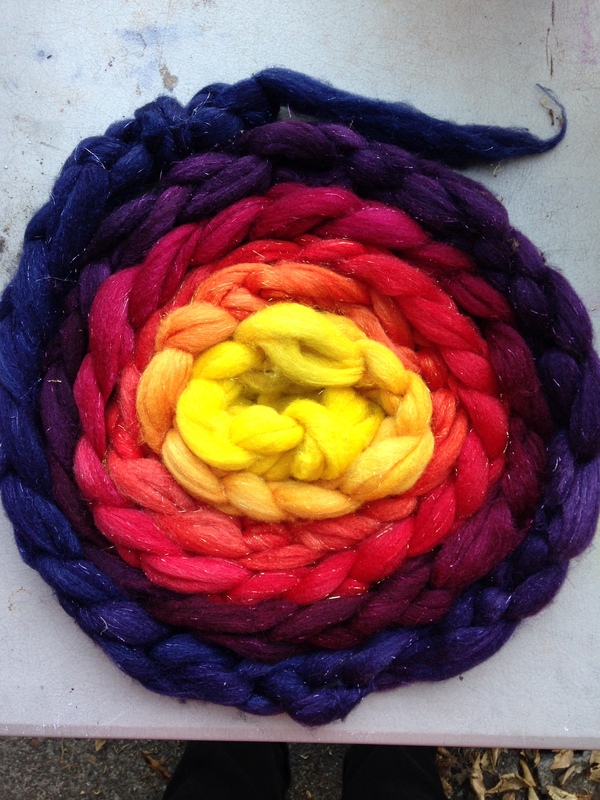 So I bought some roving, and traded with a friend to get some hand cards and some of her fiber stash. 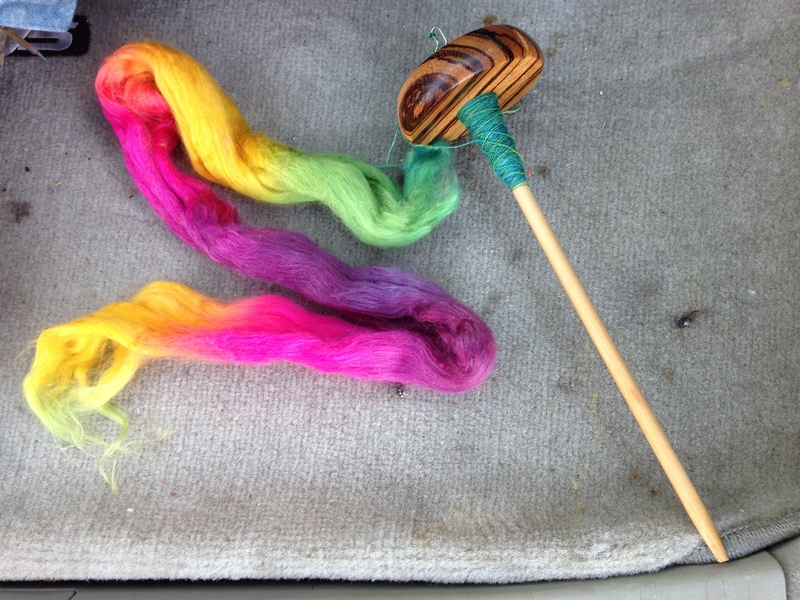 I now have about 5-6 pounds of various spinning fibers – enough for several years at the rate I’m spinning. So after I’m done practicing on the rainbow roving, I’ll start spinning this one. I’m thinking a three-ply yarn, Navajo-plied to keep the color sequence intact, would be perfect. 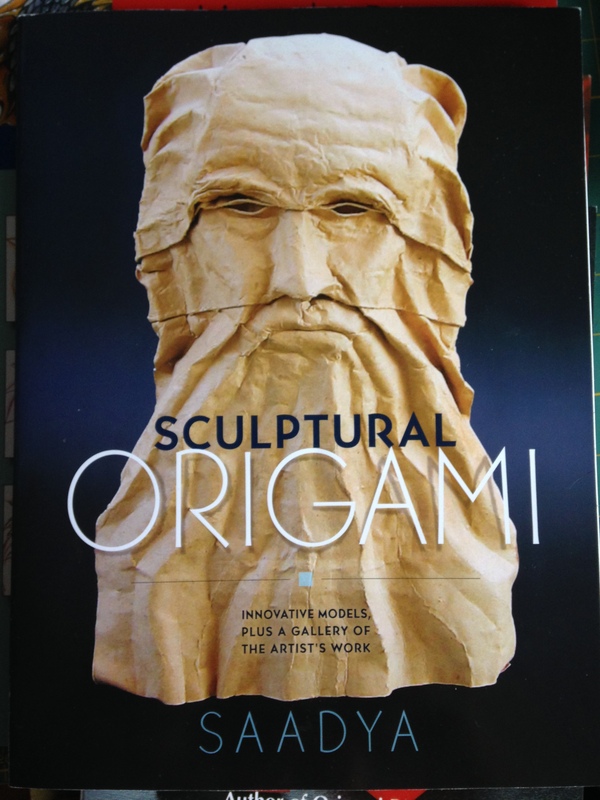 Meanwhile, I’ve been reading up on another long-forgotten interest, origami. 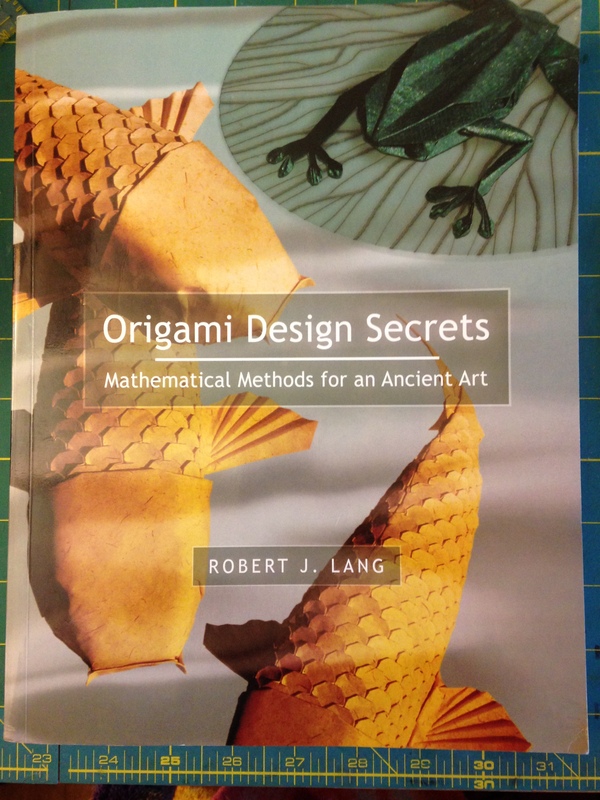 I’ve read the first 200 pages of Robert Lang’s Origami Design Secrets – a fantastic book about designing your own origami models. I haven’t studied it at great depth, but I understand the basic strategies that he’s outlining. It’s very well-written and logical in its progression – you can tell it was written by a scientist! (Lang is a former professor at Caltech, and was affiliated with the Jet Propulsion Laboratory (JPL) for quite some time.) I’m really enjoying it. I’ve also tried folding some origami tessellations, but have been stymied by my small squares of origami paper. The tessellation I was attempting begins by nonchalantly telling you to fold the paper into 1,024 squares of equal size, so you can imagine that on an 11×11 sheet of origami paper, those squares are very small indeed! 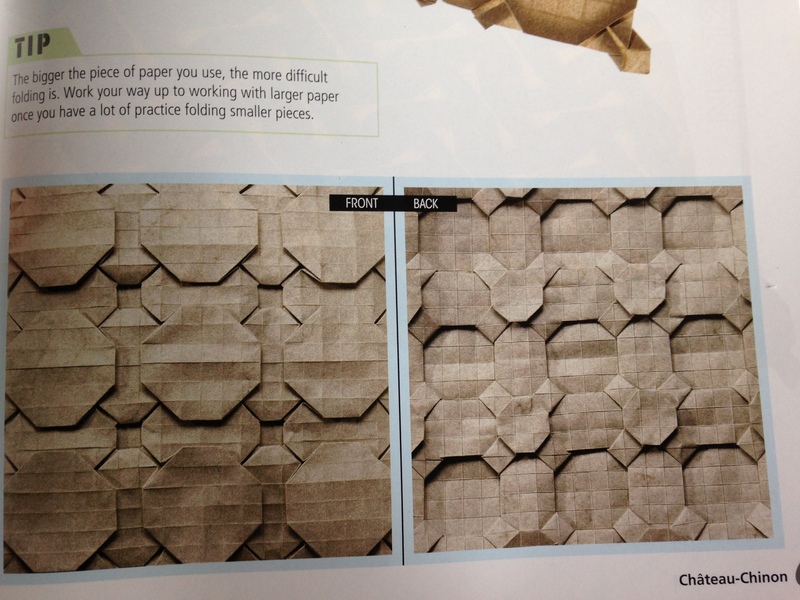 (But don’t look so aghast: you can fold those 1,024 squares with just 64 folds.) 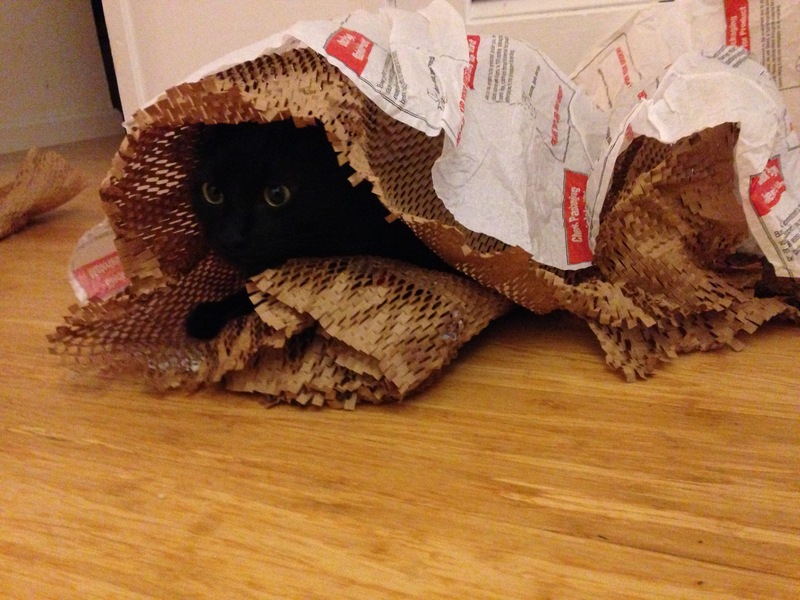 So I bought some larger sheets of origami-suitable paper yesterday and will try again this week. But if not, maybe I can pull some strings. 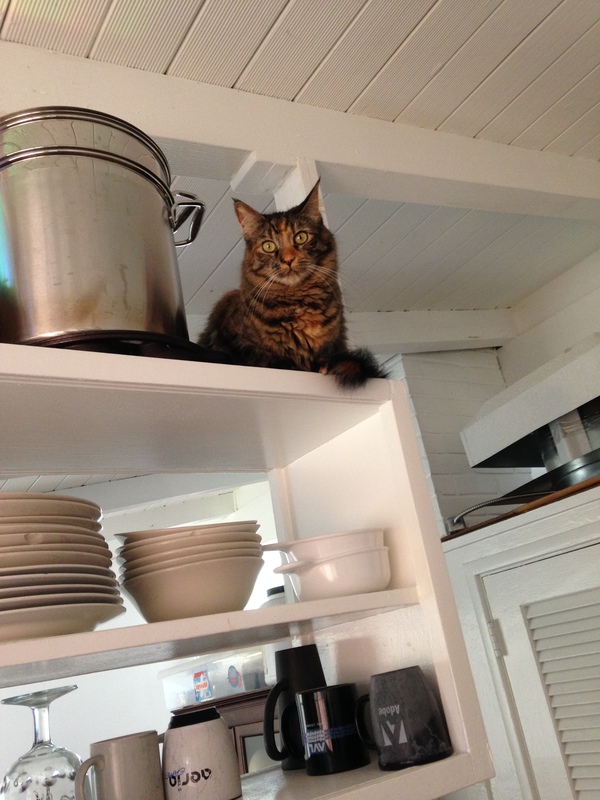 After all, I do have friends in high places. I think it was the smell that attracted him: this particular paper, dampened, smells musty, like a wet dog. 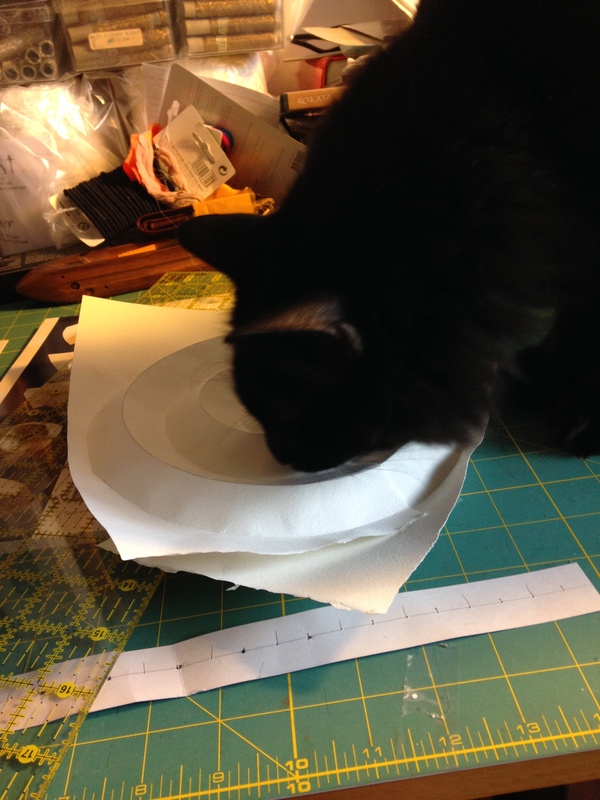 Unfortunately the paper is also tasty (if you’re a cat) – Fritz rapidly discovered an obsession for licking the paper. I’m pretty sure the glue in the paper isn’t good for him, so the paper went onto a high shelf. 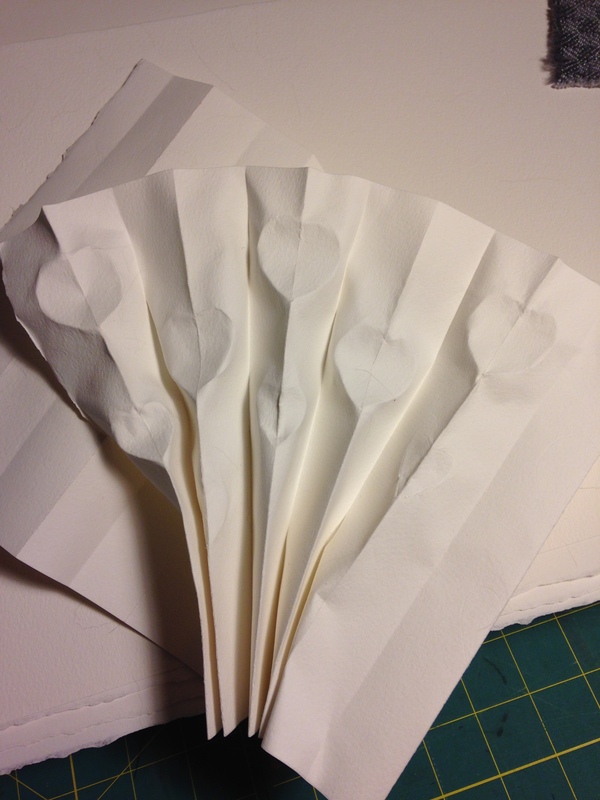 The peacock fan model was only somewhat successful – I had a lot of trouble forming the curved folds. There is an origami enthusiasts’ meeting near me on Saturday; I’ll probably go there to ask for advice on curved folds in heavy paper. 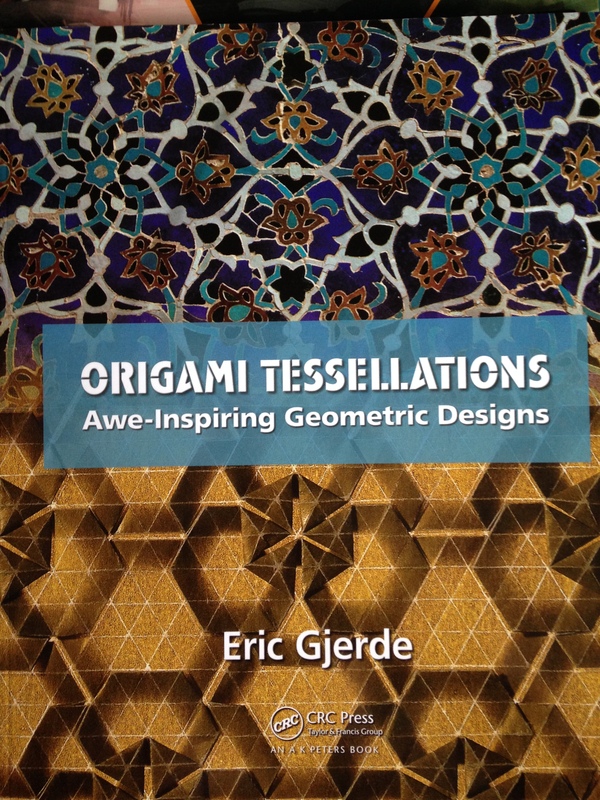 It’s a hefty tome (583 pages), but promises to be very helpful in understanding origami structures and how to design them. 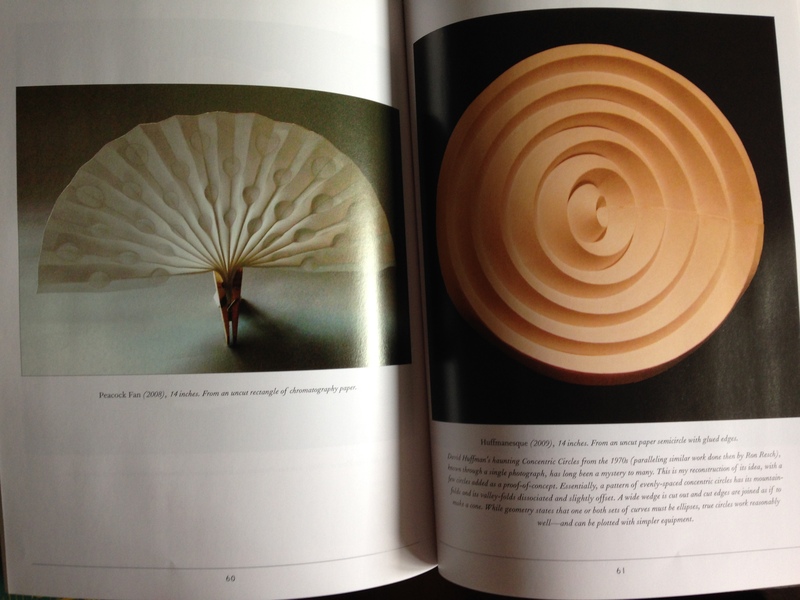 So I have mostly been reading on origami the last few days. So I expect I have a lot of reading and a little bit of practicing to do, in both drawing and origami, over the next week or so. This may seem like a scattershot approach – a little bit of this, a little bit of that – but I’ve found that’s how I learn a subject fastest. Particularly in this case, I’m a generalist – I’m not interested in going deep into either form, as my interest in both is entirely ancillary to my interest in weaving. 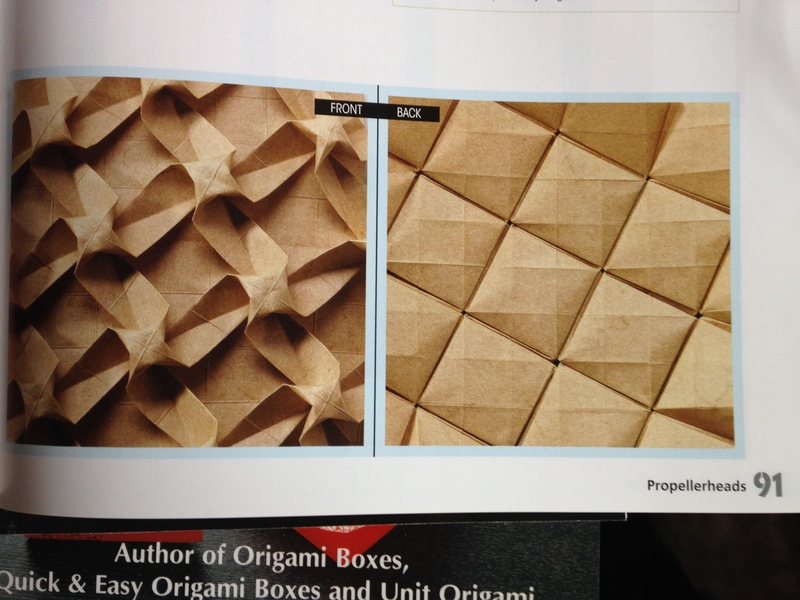 I don’t want to be an expert origamist; I only want to know what I need in order to design intriguing woven origami pieces. 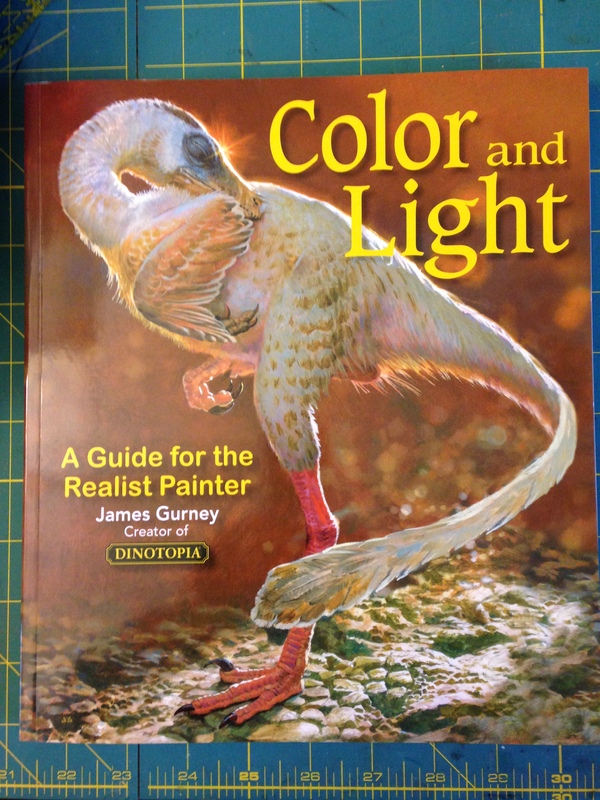 Similarly, I am not interested in being an expert artist – just enough to design for the jacquard loom. 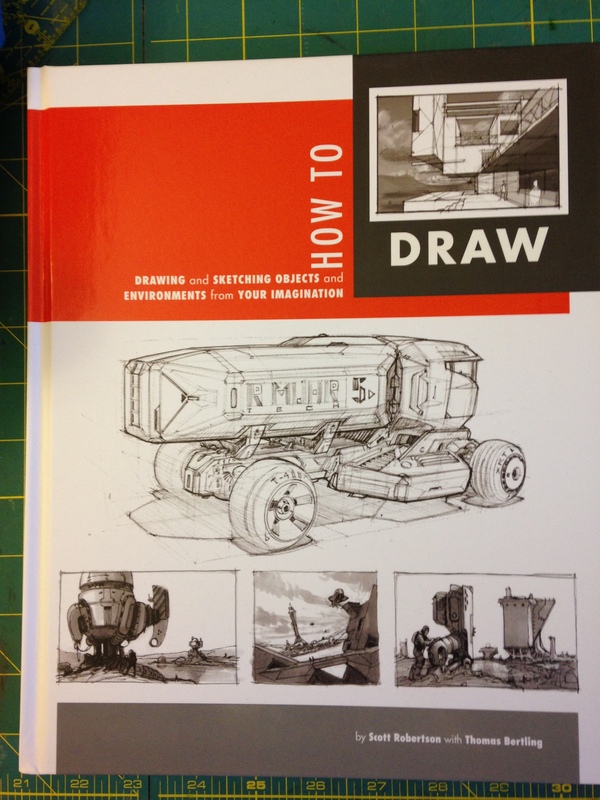 So I want a broad theoretical overview coupled with just enough practice to understand the basics. 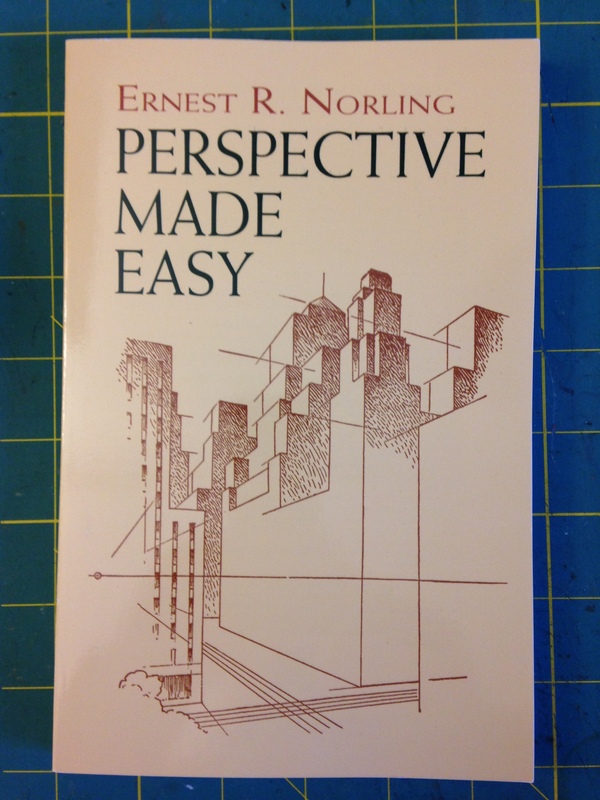 Hence the large collection of books, which I will mostly skim to get the underlying principles. If I have time and inclination later, I’ll go back and do a deeper reading. Last week was a pretty quiet week, creatively speaking – right up until yesterday, when I innocently went up to San Francisco to see an exhibit, and got dumped into a huge vat of inspiration. 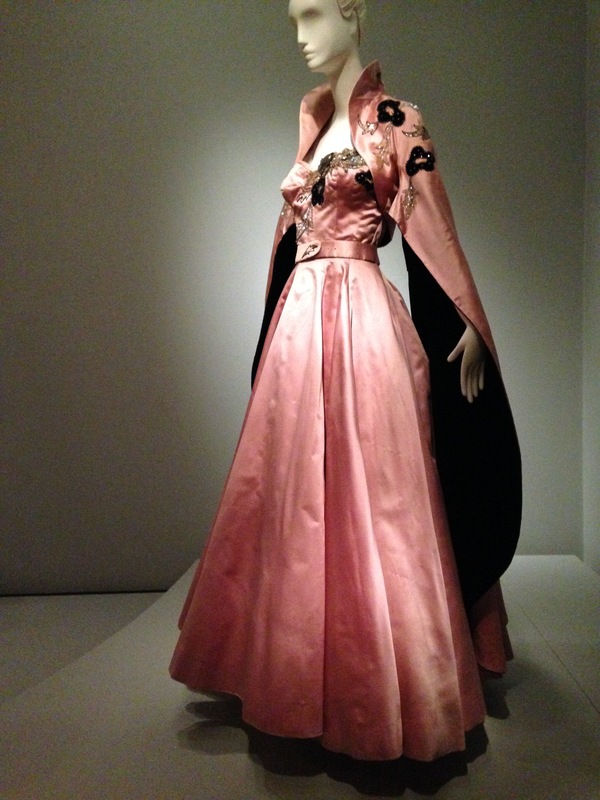 The exhibit was one I’d wanted to see for quite some time – “High Style,” a collection of couture dresses spanning 100 years, from the Brooklyn Museum’s famous costume collection. 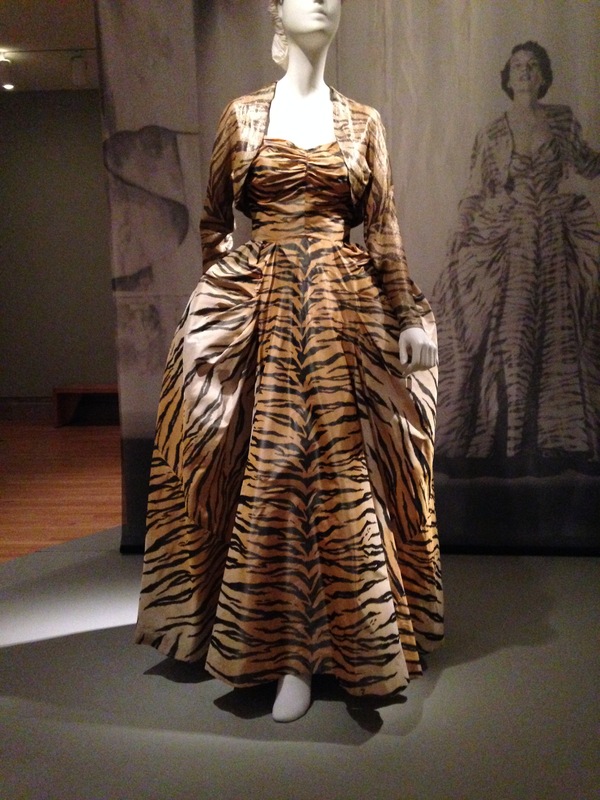 The accompanying book had been on my Amazon wish list for quite some time – full of luscious dresses. 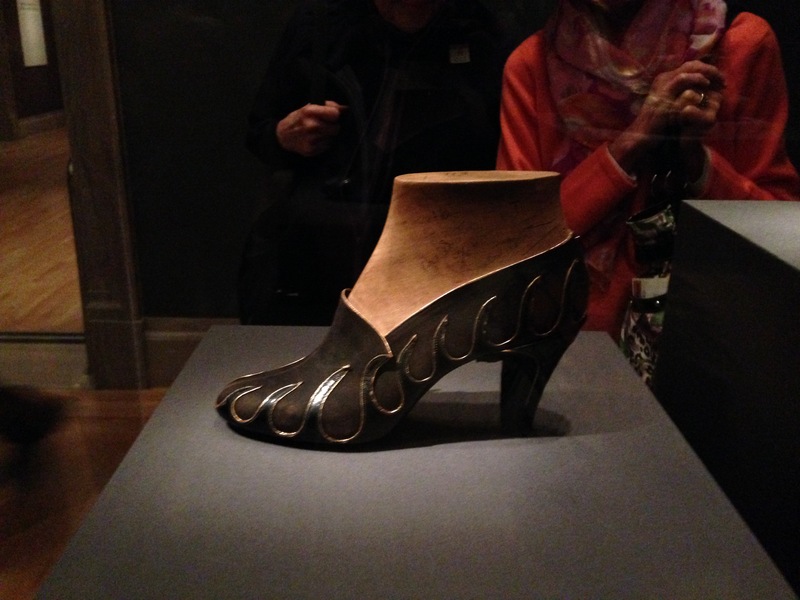 So when I discovered that the exhibit had traveled to San Francisco’s Legion of Honor Museum, I decided to go. The exhibit is fabulous. If you have a chance to see it, definitely do. 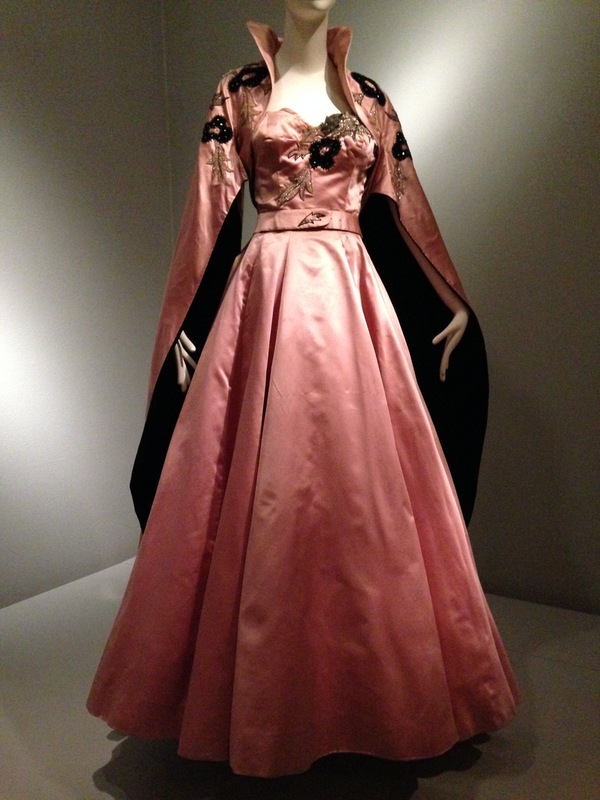 It covers a broad range of couture designers over a century of fashion. 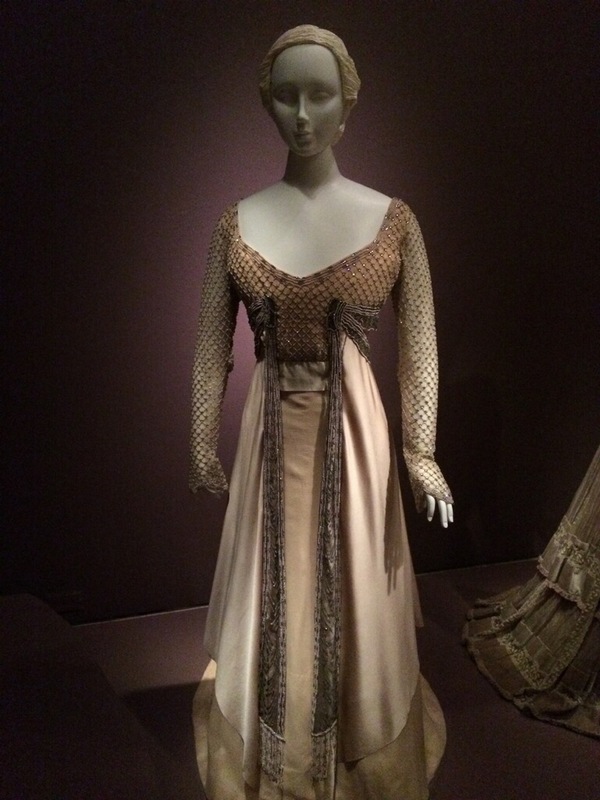 Fortunately, non-flash photography was allowed in the exhibit, so here are a few of my favorite dresses. And I simply love, love, love the sleeves on this dress by Sorelle and Micol Fontana. At first blush, they look like a cape! 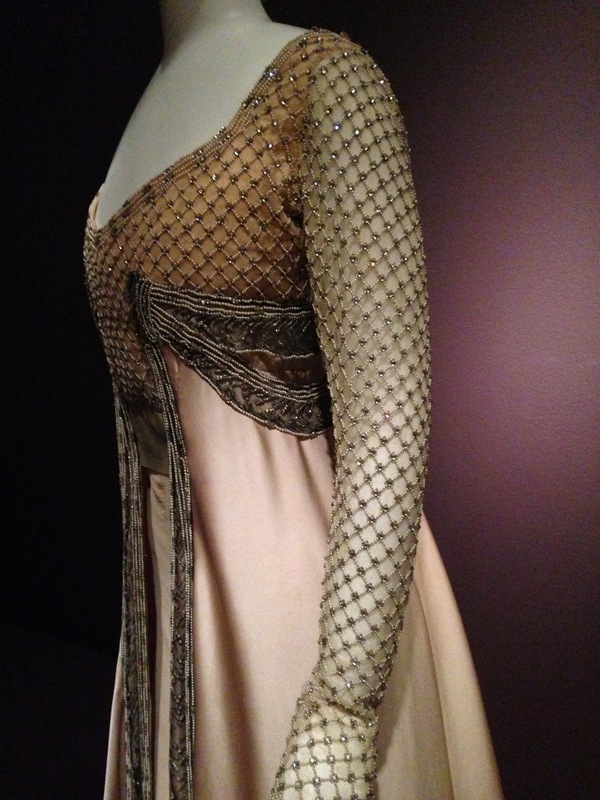 I love the drama of the contrasting sleeve and lining, and want to use the idea in a piece. Somehow. If we’d just been walking by, I wouldn’t have noticed it – there are any number of art-paper-and-stationery stores floating around, at least in the Bay Area. 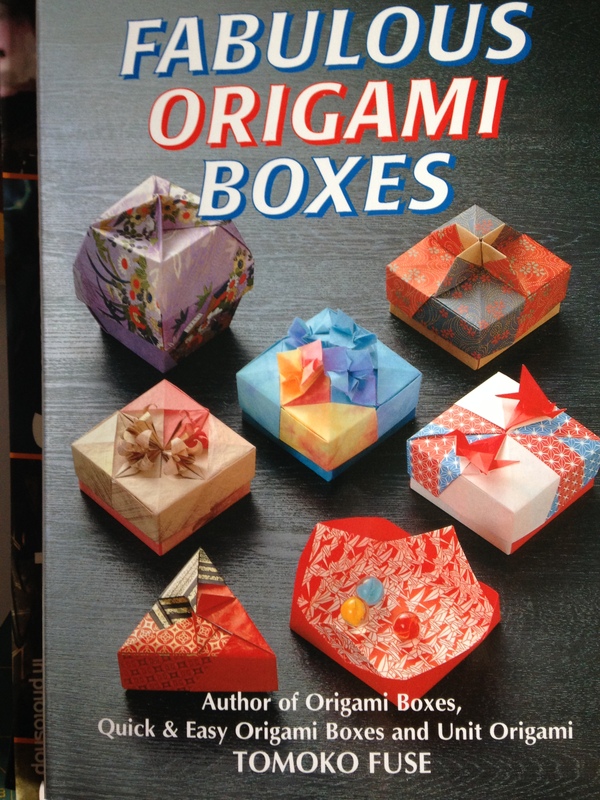 But the subtitle, “the origami store,” piqued my interest. About two decades ago I was obsessed with origami, and folded quite a few complex models before giving it up for other pursuits. 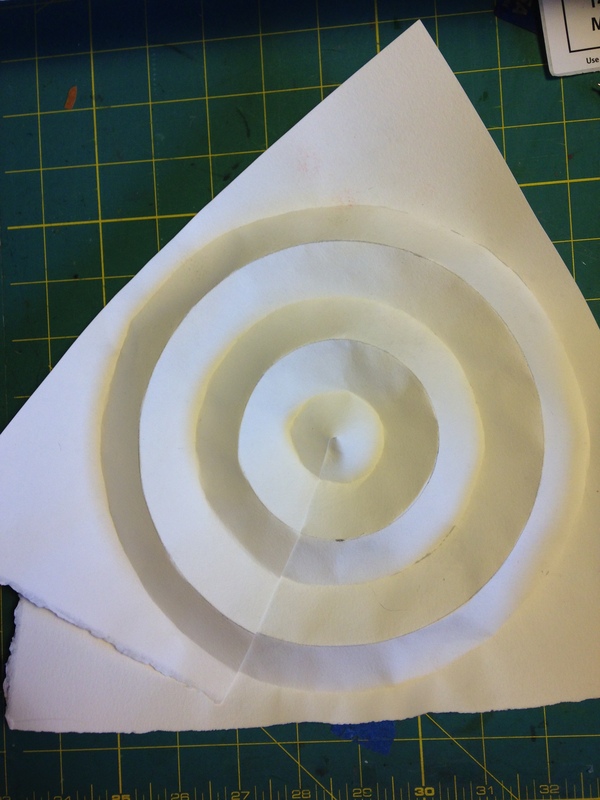 But I have never entirely lost interest in the art of folding paper. Origami has evolved far beyond the simple paper crane, and a quick look through this shop showed some of the amazing possibilities. And it may have addressed one of the questions I’ve been wrestling with: what format I want to use for my woven art. I don’t want to do clothing forever, but I enjoy a three-dimensional format; two-dimensional work leaves me, well, flat. 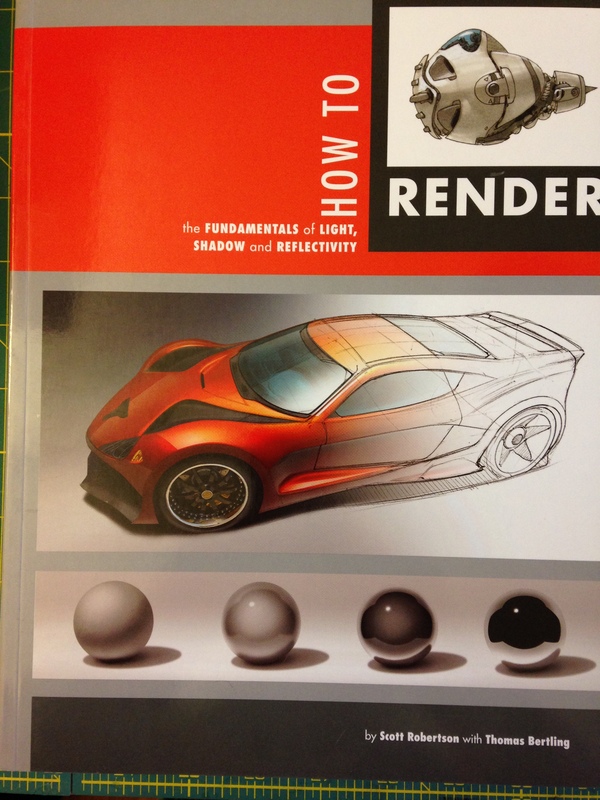 But what three-dimensional things could I do with cloth, that aren’t clothing? Some of the more complex tessellations may be more suited to plain cloth, but I found a ton of inspiration here. I’m super excited about all these possibilities, and can’t wait to try them out! 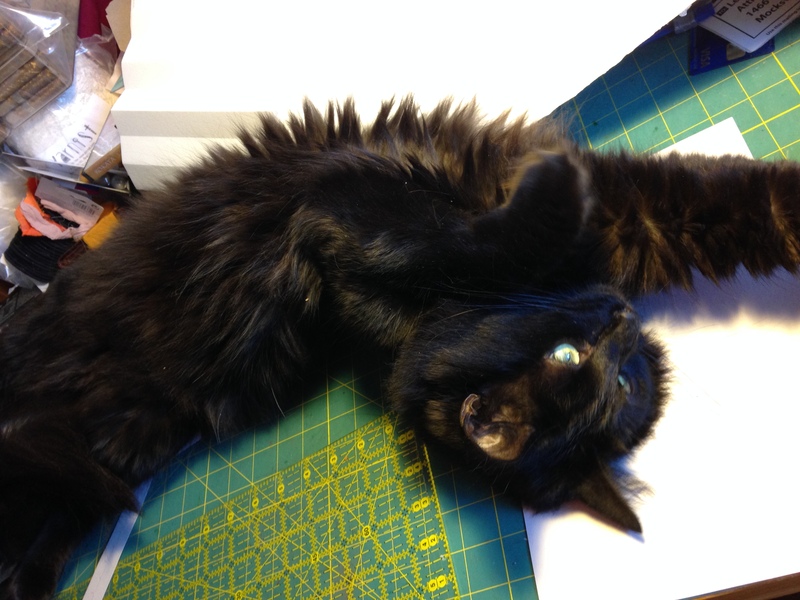 Finally, here is Fritz, doing some paper-folding of his own.